Posters of his face have plastered the Mission for months, but his name is one rarely spoken outside the Bay Area even though—like Michael Brown in Ferguson, Eric Gardner in New York, Oscar Grant in Oakland—he, too, died at the hands of local law enforcement. That name is Alejandro Nieto, a 28-year-old who on March 21 was shot by San Francisco Police Department officers on Bernal Hill. Today, Nieto’s family and friends will march from the place on Bernal Hill where he died to the San Francisco Federal Building to file a federal civil suit to elevate his case, if not into the national conversation, to a higher court. The suit’s filing comes a day after the family delivered a 1,000-signature petition calling Attorney General Eric Holder, among others, to launch a federal investigation into the shooting. In the five months since the incident, the question of whether police officers were justified in discharging their weapons has mainly centered around one fact. Nieto was carrying a Taser that, according to police, he aimed at officers who confused it with an actual handgun and fired in self defense. Up until now, the police account has been the only version available detailing what exactly happened that day. However, this week the lawyers of the Nieto family announced they have new testimony from eyewitnesses who saw the events leading up to the shooting. Nieto, the new witnesses have told his family, never pointed his Taser at the officers. This account is in direct conflict with the version of events detailed by Chief of Police Greg Suhr at a community meeting held in March days after Nieto’s death. The conflicting narratives make it impossible to know what exactly happened on the day. 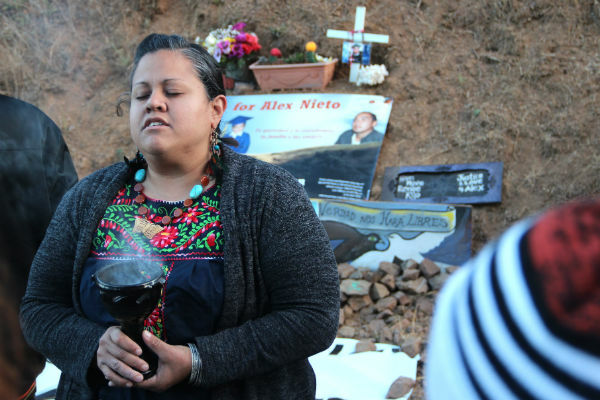 What is known is that on Friday, March 21, before heading to his work as a security guard at El Toro night club, Alex Nieto went to the top of Bernal Hill to eat his dinner. A little after 7 p.m., an encounter with San Francisco police officers ended the 28-year-old’s life. 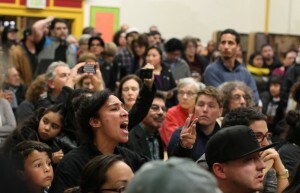 At the March meeting following the shooting, Suhr said that officers arrived to the park responding to a 911 call from someone who had seen Nieto in Bernal Heights Park resting his hands on what the reportee believed was a gun. “When the officers asked [Nieto] to show his hands he produced the weapon, and the officers say they saw a red light from the Taser, and they believed it to be firearm,” said Suhr at the meeting, where he demonstrated the Taser’s red tracking light to the gathered crowd of about 200. Suhr said four officers discharged their weapons and when Nieto went to the ground, he continued to track the officers with the red laser sight of the Taser. “They fired in defense of their own lives,” Suhr said. The police haven’t stated how many bullets were fired, but the legal team of the Nieto family say that, according to audio from a neighbor’s surveillance camera, there was a volley of at least 10 shots. The website 48Hills has the audio in question. For Benjamin Bac Sierra, a good friend of Nieto and one of the organizers of the activist group Justice and Amor for Alex Nieto Committee, the police department’s story never made sense. Nieto, he says, was a trained security guard and would have never pointed a weapon at the police. Now, he says the Committee’s lawyers have eyewitnesses to back up this belief. After a preliminary investigation immediately following the shooting, the officers involved have returned to work—their names have yet to be publicly released. However, there are four ongoing local investigations into the incident, all of which are waiting on the finished report from the Medical Examiner, which has yet to be released. The Office of the District Attorney as well as the Office of Citizen Complaint are both investigating the incident. The internal affairs unit of the police department is conducting both an administrative investigation, to determine if proper protocol was followed, and a criminal one. The status of these investigations and when they’ll be complete is murky. Family and friends of Nieto have lost faith in local efforts. After a May meeting with District Attorney George Gascón in which they say he promised to expedite the filing of the Medical Examiner’s report—which is necessary for the completion of all the ongoing investigations—nothing seemed to happen. Neither the District Attorney’s Office nor the Medical Examiner’s Office responded to requests for interviews for this story. 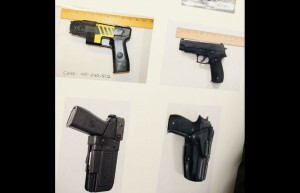 Side-by-side comparison created by SFPD of Taseer gun (left column) and standard firearm (right column) presented during March community meeting. In June, the City Attorney’s office denied a claim made by the family’s legal team that there was any wrongdoing by the city. In addition to the suit, friends and family of Nieto have gathered over a 1,000 signatures for a petition directed at Attorney General Eric Holder asking that the Justice Department conduct its own independent criminal investigation. Yesterday, on the five-month anniversary of Nieto’s death, they delivered this petition to an FBI agent in the San Francisco Federal Building. The petition argues that local authorities, particularly the District Attorney, have a significant conflict of interest that will hamper any meaningful local investigation. “George Gascón has been a police officer since 1972, most recently serving as the Chief of Police of San Francisco from 2009 to 2011 before being designated District Attorney of San Francisco in April 2011. He has a serious conflict of interest and lifelong career bias in favor of police officers,” reads the petition’s text. With national attention on Attorney General Holder as he visits Ferguson, Missouri this week, it’s tempting to think the Justice Department is ready to take on the issue of excessive police force throughout the country. But civil rights experts remain skeptical. Longtime civil rights attorney Walter Riley, a board member of the San Francisco chapter of the National Lawyer’s Guild, isn’t sure Holder, despite the publicized visit to Missouri, will fully intervene in Michael Brown’s case, much less Nieto’s. In his time as a civil rights lawyer, Riley has seen local government unwilling to prosecute their local law enforcement. A San Francisco Examiner investigation from earlier this year found that since 1990 there were 61 deaths from officer involved shootings in San Francisco. With the exception of the Johannes Mehserle in the shooting death of Oscar Grant, few have been convicted of anything. In an op-ed earlier this month, San Francisco Chronicle staff writer Caille Millner expressed sadness and disappointment at San Francisco’s sluggishness to investigate the Nieto case. But without video evidence and the kind of furor present elsewhere, Millner isn’t sure this local incident of police violence will rise to the level of public awareness or scrutiny of Ferguson. But she does think local officials could be doing much more. Lorena de la Rosa leads a prayer to remember Alex Nieto. Photo by Daniel Hirsch. 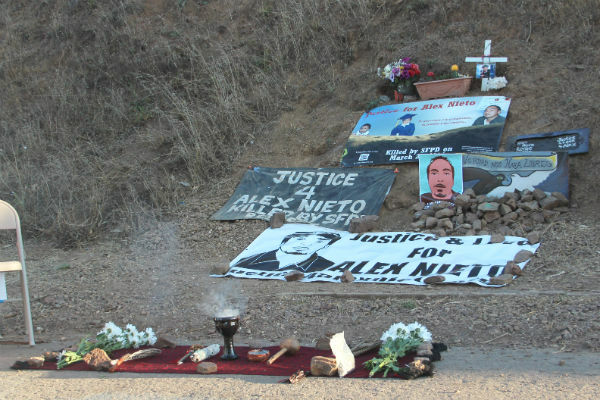 As a precursor to today’s actions, and to honor the five-month anniversary of the day Nieto died, the Justice and Amor for Alex Nieto Committee held a sunset vigil last night on Bernal Hill. It lasted until midnight and renewed once more at sunrise this morning—all opening ceremonies to today’s march at noon. Supervisor David Campos was in the crowd. In terms of what he thought the best means for uncovering the whole story leading up to Nieto’s death, Campos was vague. “We want the truth to come out as quickly as possible, but there’s a lot of different ways for that to happen,” he said. As the sun disappeared behind the fog, Lorena de la Rosa, a friend of Nieto’s, held up a chalice of burning sage and led the crowd through a ritual in which they faced the East, West, North, and South and then towards the ground. “Let’s touch the earth so that we may remember the work that we’re here doing and who we’re doing it for. Let’s remember Alex, and Andy Lopez, and Trayvon,” said de la Rosa before asking the crowd to join her in reciting more names. What followed over the course of the next several minutes was a painful litany, the subjects of recent histories, most rife with a lingering sense of injustice and questions still waiting to be answered. 4 cops decided to pull the trigger that day. Officers don’t shoot people without justification. Sure some are corrupt and trigger happy but 4 decided to pull the trigger that day. That alone tells me Nieto did something to threaten them. Pretty obvious to me but tragedy nonetheless. Could have been suicide by cop. Yes, given the troubles Nieto was having with his friends and families, to the point of RO’s being applied for, it is not unreasonable to assume that this was “suicide by cop”. All the eye witness accounts certainly support that. The real tragedy here is how the usual suspect agitators are using his death to gratuitously play the race card. If a white guy has pulled a handgun on cops, the outcome would have been identical. Clearly no investigation is necessary because all the racist and class haters have already come up with the verdict. Cops attack and shoot only when it is warranted! They are omniscient and infallible machines chosen from the best, brightest and most morally upstanding members of society. How many cops are you friends with? Or are they there just to do the dirty work, but otherwise you could care less? Also, America is the land of equal opportunity and fulfilled dreams. If you are not getting opportunities or living your dreams, you are not worthy and not working hard enough. Clearly these features are not dictated by race, that’s why our lovely economic boom is equally lifting all manners of ethnicities to unheard of prosperity. Actually, its not even the color of your skin that can leave you rejected, it’s probably enough to be a woman. Except when it isn’t. Jesus, as if you don’t live in America or have access to information. Some problems with your train of logic. The chief of police tell us 4 cops discharged their weapons. No independent confirmation of that. Second your assumption that the 4 “decided” to shoot. The situation does not sound like one in which deliberate decisions were made. Most likely the police on the scene were acting on the spot according to instinct and training. Finally the assumption that if 4 cops shot then the victim must have been acting out, aggressive, etc., so giving a reason to fire. Numerous studies and countless annecdotes show otherwise. If in fact the police were coming from different angles, and shooting starts, even if it comes from another cop, everyone will start shooting. There is more than enough justification for a thorough and independent investigation. Fabrizio, you claim there is no independent confirmation of what the eye witnesses say happened. But how could there be because the only confirmation could be from other eye witnesses? And we already know what they all the eye witnesses say, and they all agree with each other about what happened. What you are really complaining about is that there are no eye witnesses who have a different account. But that is because it didn’t happen differently. You cannot have a credible witness to a non event. And that is notwithstanding this mystery witness who suddenly and oh so conveniently has just materialized after saying nothing for five months on the day a civil lawsuit is filed. If there is a worse smelling rat, I haven’t encountered it. Yes I am aware of that claim, as I clearly indicated in my last two paragraphs. However I find it extremely dubious that an eye witness would have waited for five months before very conveniently showing up as soon as money is at stake. I suspect it is someone with a grudge and an agenda, who will be exposed and discredited. The overwhelming majority of people I have spoken to believe that this incident was a genuine police shoot, and I am at a loss to understand to why ML is pandering to the conspiracy theorists and “usual suspect” ideologues who are trying to parlay this tragedy into a political vendetta against those who uphold public safety and fight crime. After finding out the facts of what led up to this incident, it’s very obvious that the guy with the out of control dog helped get someone killed. Likely would have never happened if that guy was a responsible dog owner. Sadly typical of many dog owners. They act like the rest of us agreed to help them deal with their little poop machine. Lame! Also it’s a joke how many dog owners claim their dog is under “voice control”. When a dog sees something it wants, usually food, it goes right after it and completely ignores it’s owner. This is true of around 98% of the dogs out there. Get a clue and do what it takes to control your animal, otherwise don’t own one because you can’t handle it. This is so completely ridiculous and stupid it is almost not worthy of a response. You must have left your brain at home if you are seriously saying that a dog owner, who had his/her dog at a dog park (yes Bernal Hill is a dog park) is to blame for Alex Nieto’s death. Blame the cops or blame Alex Nieto, but it is complete garbage to blame the dog owner or his/her pet. Also bernal hill is not a ‘dog park’, it’s a park for everyone where dogs also happen to be allowed. Also dogs are not allowed in any California food establishments by law, which is notoriously ignored. Next time you see a dog near the plate of food you paid for it is time to react and send it on to animal control. It is a profound statement that now dogs have greater status than many people in SF.